The Silver Dollar was a coin that once circulated in the United States, but it was last made for circulation in the early 1900’s. 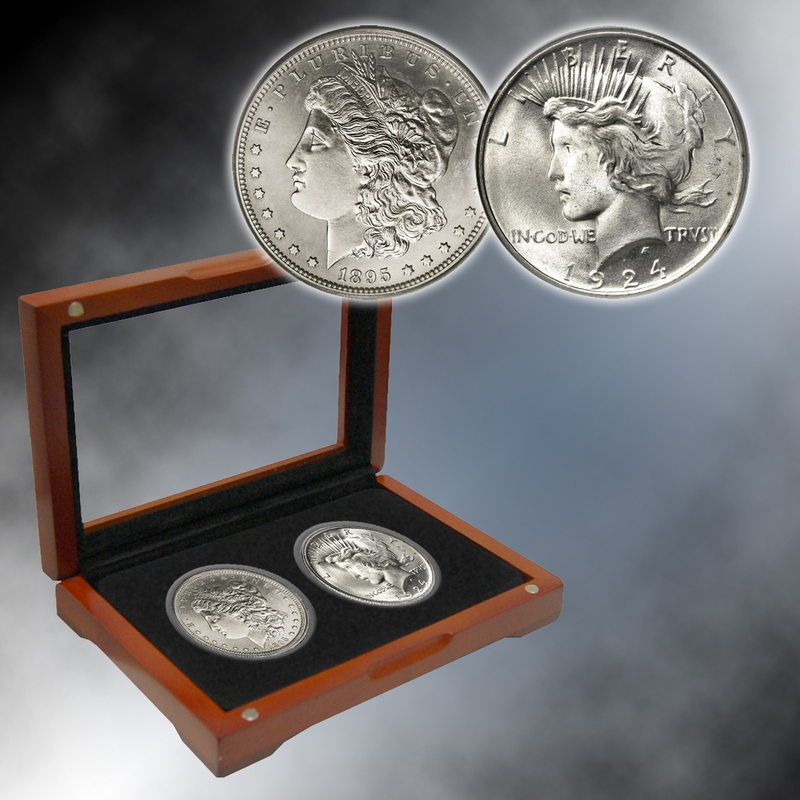 This collection brings together two historic Silver Dollars spanning two centuries – a Morgan Silver Dollar from the “Wild West” 1880’s and a Peace Silver Dollar from the “Roaring Twenties” 1920’s. Few coins survived through the years, and this set is a seldom-seen pairing from two different centuries. Both Silver Dollars were struck by the U.S. Mint in 90% pure silver, and each contains more than ¾ ounce of silver. They are among the most beautiful and most treasured of all U.S. coins. The Morgan Silver Dollar is one of America’s favorite classic coins. It was the preferred silver coin among “Wild West” settlers, outlaws, and prospectors alike in the 1880’s because of its large size and silver content. The obverse portrays Liberty wearing a cap (an ancient symbol of freedom), while the reverse features a heraldic eagle holding both the olive branch of peace and arrows of war. The Peace Silver Dollar was the last Silver Dollar made for circulation. Struck in celebration of world peace after World War I, it was first made in 1921. This coin is guaranteed from the “Roaring Twenties.” It features Liberty on the obverse and an eagle and the olive branch of peace on the reverse. The word “Peace” is at the bottom.